The Hungry Earth/Cold Blood feels more like classic Doctor Who than anything seen before in the new series, tapping into how everyone remembers the Pertwee era to be, and virtually every reviewer has pointed this out. But no one seems to appreciate the equally distinctive Colin Baker feel, with protracted torture scenes and luminescent underground sets; I must confess that Vengeance on Varos was more on my mind than Pertwee's encounter with the Silurians, who this time around look more human than reptilian when their masks come off. This is a compliment, mind you, since I like more about Colin Baker than most, and less about Pertwee than many. If that sounds ambiguous, rest assured this is a good story in a season that, amazingly, hasn't yet produced a single dud. The minimalist setting is a welcome reprieve from the usual noise, involving only four characters besides the Doctor, Amy, and Rory. Our heroes step out onto the Welsh countryside in the year 2020, where they find blue grass, an isolated drilling project, and become fast involved in strange occurrences. Corpses have been disappearing from undisturbed graves, and it doesn't take long to catch on that the body snatching is coming from below the earth. We aren't fully exposed to the underground threat until Cold Blood, which allows The Hungry Earth to breathe and unfold like a Sherlock Holmes mystery, and I'm hard pressed to say which half is more impressive: the first for its haunting graveyard site, or the second for the alien underworld. As in the Pertwee classic, the story takes a tired cliché and turns it on its head. The alien invaders aren't really aliens but "Earthlians" who have as much claim to the planet as humanity. Having evolved on Earth millions of years ago, these homo reptilians had reached the point of advanced civilization before a (supposed) apocalyptic catastrophe drove them to seek shelter underground, waiting in suspended animation for the disaster to blow over. This time it is a drilling project that awakens them from their slumber, and they retaliate by abducting the drillers in preparation for war. 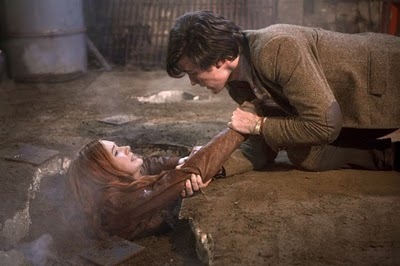 They manage to snag Amy, despite the Doctor's furious attempt to keep her from being pulled underground, and before she knows it she's on the dissection table. But it's when the Doctor is later screaming and writhing in agony under decontaminaton that we really feel the ghost of Colin Baker. The new series hasn't gone to places like this -- save in Dalek when the Ninth Doctor got tortured by Henry Van Staten -- and it's ironically fitting that such disturbing treatment occurs at the hands of "aliens" who are most like humanity. And even for the good: The Silurians are complex in their politics, certainly not all warmongers, and enough of them want peace that the Doctor is able to engineer a negotiations session for terms of coexistence. 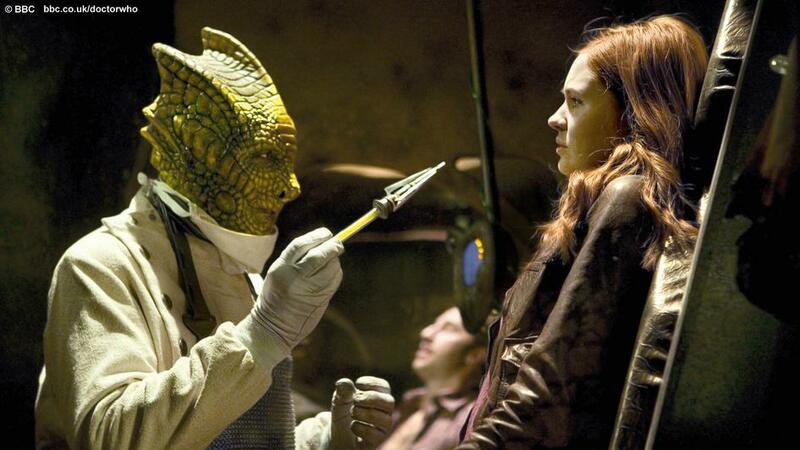 The bargaining table is of course doomed from the start -- abruptly dissolved when it is explained that the Silurian hostage has been killed -- but fascinating for what it reveals about the Doctor's political compass. 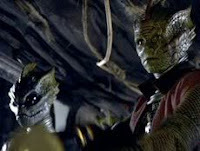 In contrast to Vampires of Venice, where he refused to allow even one city to save an entire species, and in most cases where his conscience must carry the weight of aliens he destroys on humanity's behalf, here he bends over backwards to put Silurians on the same playing field with homo sapiens. "From their point of view, you're the invaders," he lectures the drillers in exasperation, and he's obviously right. The underground realm is wonderfully realized with its luminescent reds and greens, and by this point in the season I feel like I've fallen completely down the rabbit hole. The abundance of "Alice" cues haven't exactly been subtle, but in The Hungry Earth/Cold Blood we go literally down. Moffat has put a lot of thought and planning into his fairy tale, and the entire season is shaping up to be a work of art. It's also worth mentioning that we've gone through 70% of it without a single bad episode. Usually by this point in a Davies season I've dished out a few 1- and 2-star ratings, but this year, so far, remains free of lemons. Good analysis, Loren. And bang on the money. 4/5 it is, with Rory's death a really emotional conclusion. This is getting worrying – it seems all three of us largely agree. I do like the subversion at the end: you know there's going to be one last "surprise" attack, but as you say, no idea Rory will get it (well at least until the finale!). I wasn't quite so sure what I was going to think at first, because that drilling down to something nasty is such a cliché, but it had me from the point Amy got sucked into the earth.